Birmingham AL Range Repair | Parts & Service | Service Care, Inc.
Let us try repairing your range before you settle on replacing it. Many major problems can be easily corrected by knowledgeable technicians. We provide fast, affordable range repair when you need it most! Call us at: (205) 956-3777 for a free quote today! Whether your range is gas or electric, let us deliver affordable, same day service. We’ll get it up and running fast so you can get back to cooking. Dacor Ranges – May not heat properly. Wolf Ranges – Parts, repairs or not heating like it's supposed to. Viking Ranges – Electric or gas models, may not be heating correctly. Thermador Ranges – Various heating issues or needs parts and/ or repair. Never try to service a gas range unless you know what you’re doing. Connected to lines of natural gas, they pose considerable risk of poisoning or explosion when tampered with. Our trained technicians can safety turn off the gas, service your range, check your gas lines, and reconnect everything after the repair. Electric ranges use a variety of methods to cook your favorite dishes. Older models heat up metal coils which then transfer heat to your pots and pans. Originally, the stove coils were visible, and pans were directly applied to them. Today, they are covered by glass cooktops which make cleanup much easier. 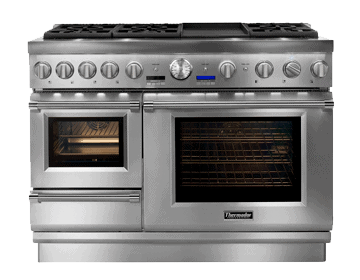 Some of the newest models cook with infrared or inductive technologies. These techniques apply quick and even heat to whatever you’re cooking. No matter how it functions, if your gas or electric range is not heating, you have a serious problem. Problems are not limited to producing limited or no heat. Running overly hot or providing unpredictable heat are equally problematic. Let our local, reputable range repair technicians figure out exactly what has gone wrong and provide quality repairs. When you bought your range, you invested in a quality product for years of dependable use. Let us help it continue to provide that service. And if it’s under warranty from most manufacturers, we’re certified to provide all repair to your range free of charge. Over 350 Five-Star Reviews on Customer Lobby! Is your range still under warranty? We can provide certified warranty service for most brands, meaning it won’t cost you a thing. Not under warranty? Check out how affordable we can make range repair. Also, we guarantee all customer-purchased parts and labor with a one year warranty, regardless of the machine’s age. That’s because we want you to be 100% satisfied in our service. Prefer to do the work yourself? We also sell parts so you can do your own repairs at even greater savings! We also provide advice at no cost, so you can be confident in your project. We provide the affordable range repair in Birmingham, AL.